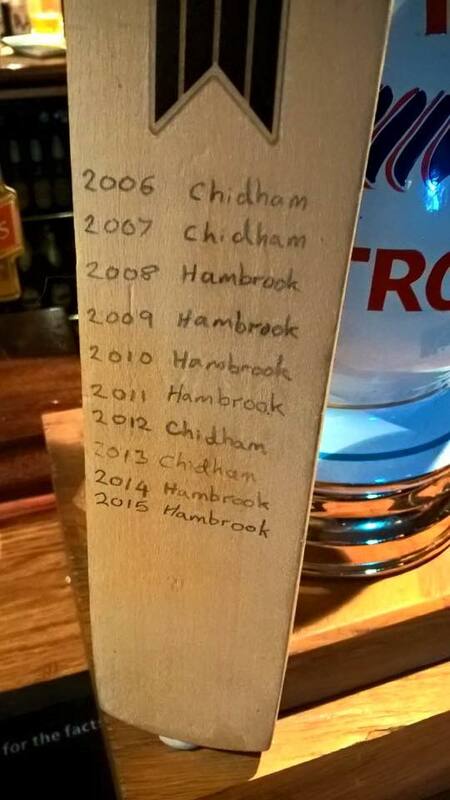 The Chidbrook Cup is a limited overs cup match which since 2006 has been played annualy between the local villages of Hambrook and Chidham and features many of the Chidham & Hambrook CC players. The first two cup matches were hosted at Fishbourne before moving to West Ashling from 2008-2015 and then Bosham from 2016 and since it's inception Hambrook have won 9 times and Chidham 4. The reigning champions are Hambrook having won the thirteenth renewal on 16th September 2018 (match report and statistics below) and the trophy is permanently on display in the Barley Corn pub. The Chidbrook cup rules are; 25 overs per team, every player bowls 2 overs and then 5 more players can have an extra over each, normal LBW rules, 2 runs for a wide or no ball and no re-bowl. The Hambrook players generally have to live north of the main railway line and the Chidham players generally have to live to the south. Each player needs to bring a tea item to be enjoyed by players and spectators during the half-time interval. 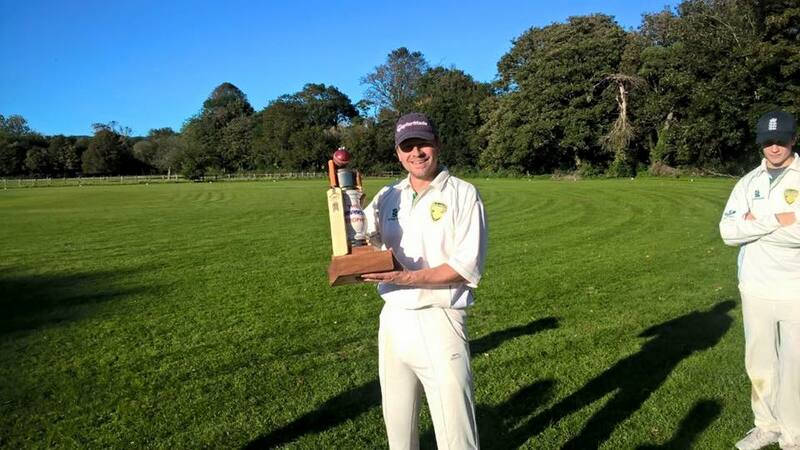 Hambrook made it five Chidbrook Cup wins on the bounce after a five-wicket victory in one of the most competitive renewals the trophy has ever seen. Following several weeks of social media banter, both captains turned to their big guns to try and secure victory with Phizackerley calling upon the services of Kezza and Dave McClean for Hambrook and Davey turning to Ben Gottesman, Rory Peterson and Matt Chesshire for Chidham. As it was Peterson almost single-handedly won Chidham's first trophy since 2013 by scoring 73 runs not out, taking 2 wickets (including a wicket maiden over) and 2 catches but that wasn't to prove enough. Both sets of players tucked into Pod's delicious Chichester Harbour gin cocktail before the match which helped ease the tense atmosphere and then skippers Keith and Tom carried out the pre-match toss-up at the Bell End of the wicket. Davey won and elected to have his Chidham team bat first. Peterson opened and was soon on his way back to the clubhouse with six quick boundaries and there were plenty more to follow later in the innings - it looked like a dropped catch on the boundary by Van Niekerk could prove costly. Fellow opener Burt was soon gone for 4 runs in one of the most bizarre caught & bowled wickets ever seen - Van Niekerk bowling, parrying his attempted catch onto batsman Chesshire stood next to him, it then bounced several times on Chesshire before Willem eventually secured the ball in his hands! Matt Chesshire was ticking along nicely but then got caught behind by Steve Clark from a Kezza bowl when on 14 runs and then Willem took the notable scalp of Ben Gottesman (8 runs) with an excellent bowl. Hambrook then started to eat their way through the rest of Chidham batting order; Walmsley bowling out Wild (1), Vinnie bowling out O'Donohoe (7), D Phizackerley taking the wicket of Davey (0) and Andy Gury being run out. Then Dave McLean bowled out Andy Clark and Matt Rawlinson for ducks which left Chidham on 116-9 with six overs left to play and only the wickets of Strudwick and the returning Peterson to go. Strudwick and Peterson made a determined last stand though and saw out the remainder of the innings and their cause was helped by some dubious bowling and fielding by the Hambrook players. Peterson eventually reached a magnificent 73 runs not out - the highest ever in Chidbrook Cup history - and his foil Strudwick got to 7 runs. During the interval players and supporting families tucked into the delicious tea spread, the highlights of which being Davey's amazing egg sandwiches (freshly laid eggs and fresh M&S bread) and Burt's delightful array of cakes, all washed down with a selection of beers and ciders from Van Niekerk's bar - a veritable feast all round! 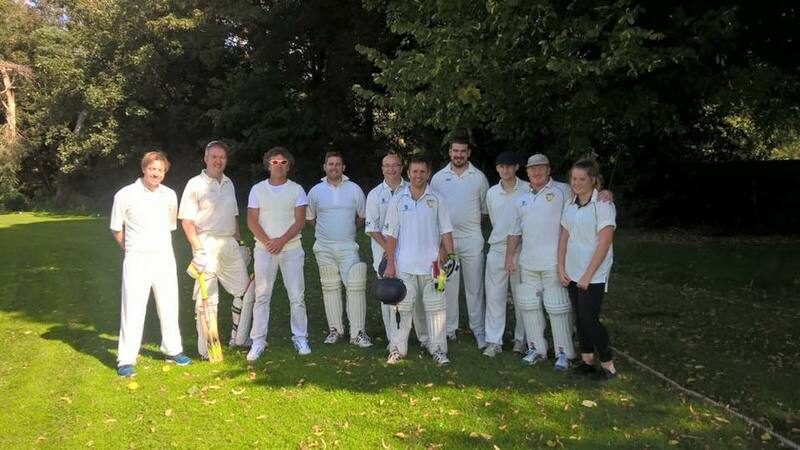 Most players would have been happy to spend the rest of the glorious sunny afternoon drinking beer, eating food and chatting to friends but there was the small matter of another 25 overs cricket to play and Hambrook chasing the 175 runs needed for victory. 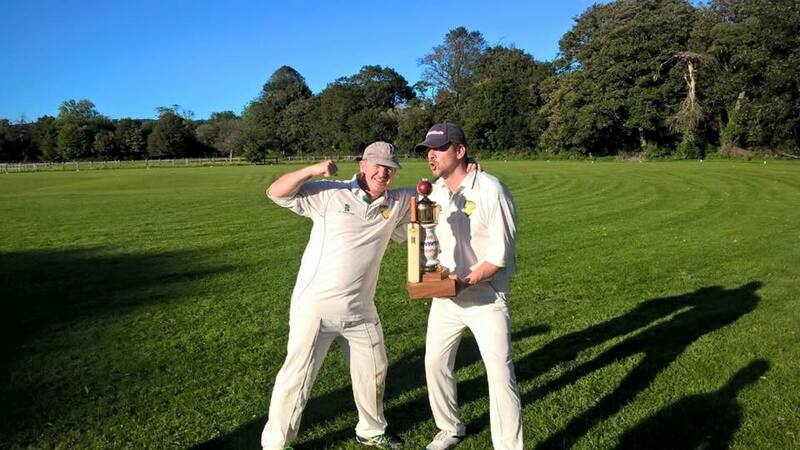 The reigning champions got off to the worst possible start though when opening bowler Petterson literally smashed Kezza's wicket with the 3rd ball of the innings. After some hasty repairs, play resumed and Will Parker and Hambrook number 3 Dave McClean soon got the upper hand on the Chidham bowlers. Steve Parker was the 3rd Hambrook batsmen to get back in the hutch after a mercurial batting display which saw him hit 27 runs but then Joe Phizackerley and Paul Walmsley both went cheaply on 5 runs, the first wicket taken by Strudwick (caught Gottesman) and second caught and bowled by Peterson. The remaining Hambrook batsmen, David Phizackerley and Steve 'Legend' Clark, then needed to make 12 runs from the remaining 4 overs to seal victory for the Hawks with three retirees still waiting in the wings. A couple of boundaries by David then set up Steve Clark to score then winning runs with a superb boundary to make it five Chidbrook Cup wins on the bounce for the 'Brook'. The trophy was then presented to winning captain Tom Phizackerley by the Barleycorn Landlady Kelly and the majority of players returned to her pub for a few beers, celebrating a magnificent cup day for the local community played in the true spirit of the game and capping a splendid season for Chidham & Hambrook Cricket Club. All eyes are now focussed on the CHCC golf, awards and AGM day which takes place on Saturday 3rd November. Hambrook won the Chidbrook cup against neighbours Chidham for the fourth straight year in a row with a comfortable 53 run victory at Delling Close on Sunday. 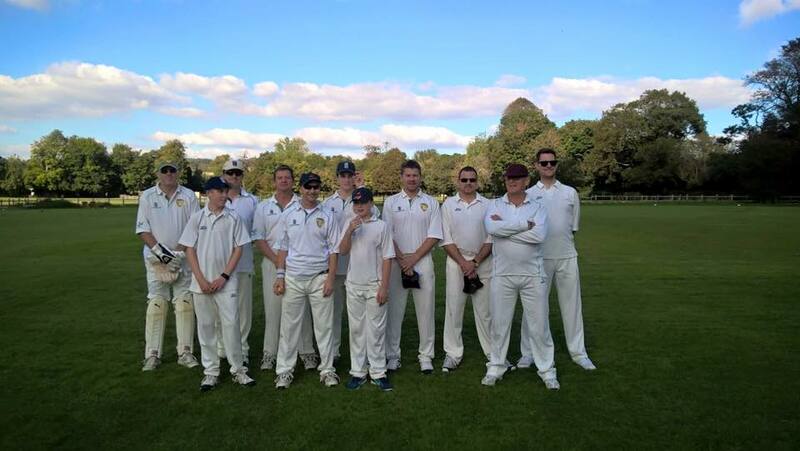 The wicket and outfield looked in superb condition following the efforts of several players from both teams the day before and with the sun shining and a sprinkling of family support the scene was all set for the annual season closer. The two captains Tom Phizackerley (Hambrook) and Keith Davey (Chidham) performed the pre-match toss up on the wicket, with Davey winning and electing to put Hambrook into bat. Will Van Niekerk and Will Parker opened for Hambrook and it wasn’t long before the reigning champs were on the back foot as Van Niekerk (0) was run out on just the fourth ball after a moment of indecision. Up stepped Paul Walmsley for his first game of the season and he soon got into the swing of things eventually retiring on 25 runs mid-way through the innings. Will Parker was also knocking the ball around well before eventually succumbing to a tame Simon Davies bowl in the ninth over when on 20 runs. Young Johnny Hodgson came in for Hambrook at number 4 and also put in some good work to reach 18 runs before being bowled LBW by Matt Chesshire. Steve Parker gave the best batting performance of the day reaching 31 runs by the innings close and Tom Phizackerley also boosted the score late on with Hambrook ending up 149-3. A fine tea was enjoyed by players and families alike in the warm September sunshine before Hambrook took to the field to try and prevent Chidham reaching the 150 runs required for the win from the allotted 25 overs. Jason Burt and Matt Chesshire opened up for Chidham and another moment of indecision in the match cost Burt his wicket in the 2nd over when on just two runs. The ominous Rory Peterson came on at number 3 and it wasn’t long before he was returning to the pavilion after reaching forced retirement (27 runs) in just a handful of overs –his haul included two massive sixes which even had the cars running for cover! Chesshire was also ticking along nicely until being bowled out by a straight V Smith ball in the 6th over when on 16 runs and it wasn’t long before his replacement P O’Donohue (4) was given out LBW after a fine delivery from Johnny. J Mansell was bowled out on just his fourth ball for a duck by David Phizackerley and at this stage with Chidham on 66-4 off 10 overs Hambrook could sense victory. 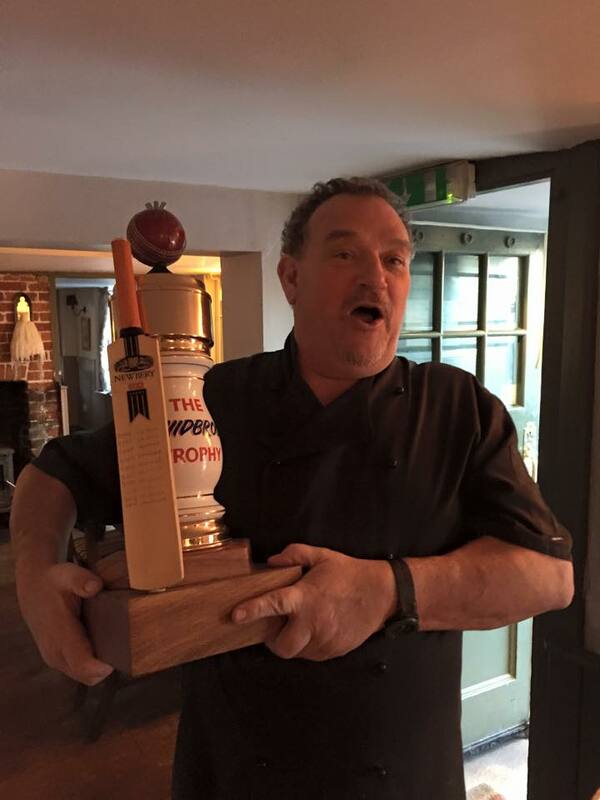 Pete Wild had other ideas though and following a superb knock in a charity match at Goodwood the day before, he soon set about the Hambrook bowlers with some amazing strokes which also saw him hit his first ever six – a feat he also repeated a few balls later. However his batting partners came and went one by one thanks to the Parker Father and Son combination of Will and Steve who took a brace of wickets a piece for very few runs; Fiahlo (4), Stecthamn (0), Strudders (0) and Davies (0). 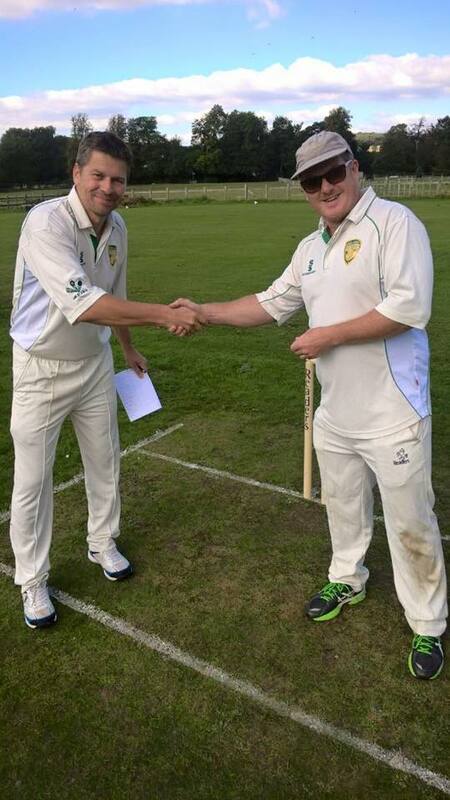 Pete Wild eventually retired on 25 and Chidham captain and tail ender Keith Davey was given the momentous the task of scoring 62 runs with only his wicket and those of Peterson and Wild remaining. Davey was soon bowled out by his opposing captain Tom Phizackerly for just 2 runs and the returning Wild was then caught behind by Clark from another Phizackerley cracker leaving Chidham 54 runs short of their target. Following the match amid scenes of jubilation the Chidbrook Cup was presented to Tom Phizackerley and the result now leaves Hambrook with 8 wins to Chidham’s 4 since the cup’s first inception in 2006. Man of the Match: Steve Parker (31 not out and 2 wickets made it a great day all round for Parker Senior). Hambrook cruised to a 46 run victory over neighbourhood rivals Chidham in the 2016 Chidbrook Cup at a sunbaked Delling Lane on Sunday. Hambrook skipper Tom Phizackerley won the toss and elected to bat first with Parker senior and junior chosen as his opening pair. Both players were quick of the mark with a number of boundary shots but Steve was eventually caught by Jim Mansell (C Pink bowler). Number 3 Vinnie Smith got a couple of boundaries before succumbing to the same fate (caught Thorpe, bowled O'Donohue) and then Van Niekerk entered the stage to assist Will Parker. Both players were soon forced to retire, Van Niekerk hitting only boundaries on his way to a swift 30 and Will Parker retired on the same score after finishing with a six. A Clark (8), H kimber (14) and T Phizackerley (10) added some nice runs to the Hambrook total and J Phizackerley (6) and S Clarke finished things off for the reigning champions with the latter putting in his best batting performance of the season. Players and families enjoyed a lavish tea in the sun whilst the children played in the cricket nets and then it was back to the serious business of the afternoon as Chidham set about chasing the winning target of 163 runs. Chris Pink and Matt Chessire opened up for Chidham but Pink was soon bowled out for a duck by young Joe Phizackerley and number 3 Jim Mansell also went for a quack thanks to family Phizackerley, this time David bowling and Tom catching. The Chidham innings was beginning to stall much like the ground machinery earlier in the day. Leon Fiahlo was soon gone for 2 runs and then O'Donohue (14) helped steady the ship before he was out LBW bowled by H Kimber. Matt Chesshire, who somehow survived an early run out scare, was ticking along nicely before he was caught deep in the field by V Smith (bowler Van Niekerk) only to find out when he walked back in that he should have been retired one run earlier. S Thorpe (1), P WIld (3), K Stetchman (0) and L Davey (0) were unable to assist Chidham in the chase and amongst all this Henry Kimber (the long lost brother of Andy Gubbs) managed to secure a well-earned hat-trick of wickets which included taking one of the catches himself - however he failed to secure a jug of beer in the pub after the game. Keith Davey and Matt Chesshire (getting a deserved second bite at the cherry and replacing the absent Simon Davis) kept their wickets intact to see out the 20 overs but ultimately Chidham fell well short of their target and it was left for Chidham skipper K Davey to present the 2016 Chidbrook Cup to Tom Phizackerly in a champagne fuelled celebration. 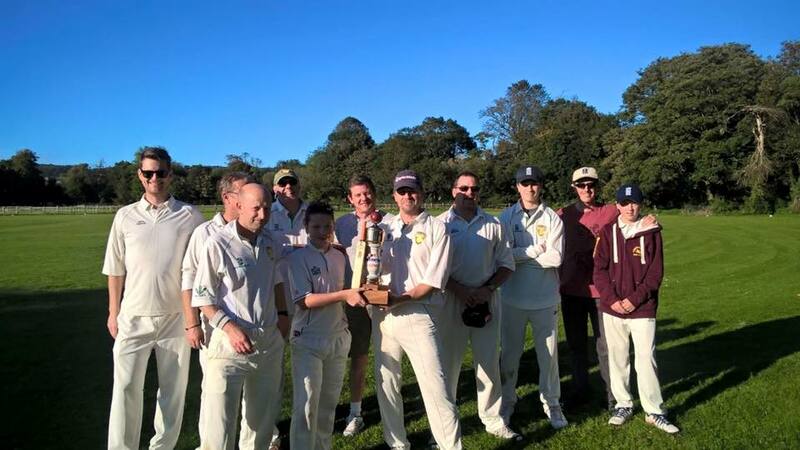 Hambrook retained the treasured Chidbrook Cup with a comfortable 9 wicket victory over their local rivals at a sunbaked West Ashling on Sunday afternoon, in front of a bumper local community crowd. Chidham skipper Keith Davey won the toss and elected to bat first on the soft and unpredictable wicket but the start of the match was delayed by fifteen minutes due to the late arrival of star player Alex Crook and his suited and booted personal entourage (but alas no scorebook). Regular opener Matt Chesshire got off the mark quickly for Chidham with some consummate stroke play but his partner big Jim Mansell was soon bowled out by young Joe Phiz for 2 runs. New comer Alex Smith joined Chessire at the wicket and the pair knocked out an impressive 40 runs between them before Smith was bowled by Will Parker, with Chesshire being forced to retire soon after. Andy Clark and Pete Wild both added some decent runs to the Chidham tally before being caught and bowled respectively and then up stepped Jon Keynes to destroy the Chidham middle order. First he bowled out Crook for 1 (much to the amusement of Alex’s boundary fan club), then had skipper Keith Davey caught out for 1 by Willem before finally bowling out Hebden for a duck, thus finishing on impressive figures of 3-10. G. Davey was unfortunately run out and then the returning Matt Chesshire and Simon Davies made a gallant last stand with the former eventually reaching 40 runs in total before the latter was bowled out for 7, leaving Chidham on a respectable 104 all out. A sumptuous tea was enjoyed by players and spectators alike whilst the children played their own mini game of cricket and then it was back to the business of the day as the Hambrook VI set about chasing their target. Hambrook openers S. Parker and P. O’Donohue were restricted to just a few runs by Chidham’s impressive opening bowlers of Alex Smith and Andy Clark with POD eventually being bowled out by Smith for just 6 runs. However, this would prove to be Chidham’s only wicket of the day as first Willem and then S. Parker gradually reached their forced retirement figures of 28 and 25 respectively. Despite the game being finally balanced after 8 overs, the lack of wickets eventually took its toll and it was left for Hambrook skipper V. Smith, with the assistance of S. Parker and J. Keynes, to surpass the Chidham batting total on his 25th run. The overall score is now 6-4 in favour of Hambrook in this the tenth year of the Cup. I just want to say a massive thank you to everyone who took part and helped in the Chidbrook Cup this afternoon and made the day such a roaring success. From Jon, Pete, Keith and myself who booked the pitch and organised the teams, to the guys who helped prepare the pitch with Iain before the game, to the familys of all the players who turned up to support the match, to Stephen Johnson and the rest of the website team who sponsored the bouncy castle and took lots of photos (see below), to the wives of the players who helped with the tea, to David Phizackerley for being umpire and finally to Steve Clarke and Andy Gubbs for scoring, playing the music, announcing the players and scores (with the help of Ellie Walmsley) and running the kids cricket match at half time. A real community effort all round on a glorious sunny day - I'm already looking forward to next years match when Hambrook will attempt to retain the trophy. V Smith (C), P Walmsley, W Van Niekerk, S Parker, W Parker (W), T Wild, J Keynes, O Keynes, T Phizackerley, J Phizackerley, O Walmsley.